Sheriff’s Custody Personnel participated in two events this past week as a way to give back to the community. 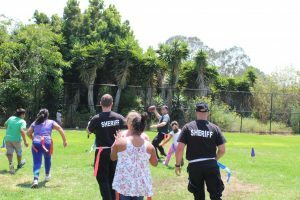 On July 25, 2018, the Sheriff’s Special Operations Response Team (SORT) took some time away from their training day to surprise a group of kids in the Monroe Summer Fun program, which is sponsored by the Santa Barbara County Recreation and Parks Department. The SORT members challenged the kids to a game of flag football. Although the kids beat the SORT team badly, there were many smiles and laughs by all participants. There were frequent high-fives throughout the game and a half-time break with Gatorade and Gold Sheriff Stickers! 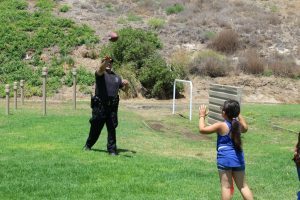 The Special Operations Response Team Members would like to thank the directors with the Santa Barbara County Recreation and Parks Department for allowing us this amazing and fun opportunity to participate with the kids and give back to our community. SORT provides an organized, structured, response to critical incidents to maintain the safety and security within the jail facility and are available 24 hours a day, 365 days a year. 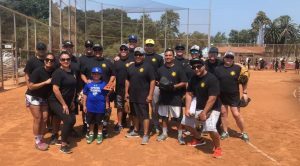 On July 29, 2018, Sheriff’s Custody and Jail Medical (California Forensic Medical Group) staff held its first annual charity softball game. The game took place at Pershing Park in Santa Barbara. All the proceeds were donated to the Teddy Bear Cancer Foundation which provides financial assistance as well as educational and emotional support to central coast families that have children who are diagnosed with cancer. We are proud to say more than $1,100 dollars was raised. The money will go to help four families in need during the holiday season. The group also puts together holiday care packages for the homeless in December. For more information on how to help, contact the Health Services Administrator at the Santa Barbara County Jail at 805-681-4211.